If you came to Montreal to experience the bohemian atmosphere of the city and enjoy local music venues, Pensione Popolo is a good drop off point. 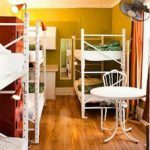 This small pension offers quite unique accommodations that are sure to please those who want to experience Montreal’s alternative subculture. 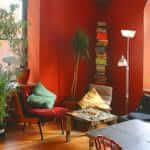 Located on the edges of the Plateau and the Mile End (two of the trendiest neighborhoods in the city – you’ll likely meet typical Montrealers – hipsters, musicians, dead broke artists who speak French, English, and Spanish all during the same conversation…at the Pensione (and the Casa del Popolo). Live musical venues are often featured on the ground floor and access is free for guests of the Pensione. Once again, its all about your standpoint. North of the Plateau, not far from Mile End, the Pensione Popolo is sure to please those looking to get off the beaten tracks. With its many bars and trendy restaurants and a bohemian atmosphere, you’ll be right in the hub of Montreal alternative subculture. The common tourist will most likely prefer centralized neighborhoods such as downtown or the Old Montreal and will surely overlook this hotel. The Laurier metro station (line 2 – Orange) is at 5-10 minute walking distance.